Thinking about an African camping trip? There are several tour companies that offer camping trips that last from a few days to a couple of months. For those, all you need to do is pack your bags and go. But, for those that prefer a DIY experience, here is some high-tech gear that will enhance your African camping experience. 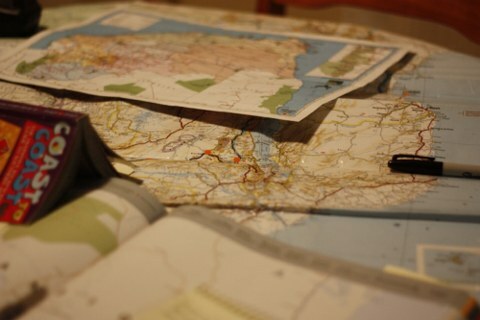 Just because you’re in Africa, it doesn’t mean you have to abandon your GPS and switch back to paper maps. Tracks4Africa is a must if you are driving yourself in Africa. Started because of the lack of good GPS maps for Africa by a group in South Africa, you just buy a SIM card through their website and load it on to your Garmin GPS. Once it is loaded, you will have access to the maps, but also other information, including: road conditions, rest camps, restaurants and even scenic viewpoints. Because it uses crowd sourced data, Tracks4Africa also offers up-to-date travel information on their website. What I love about Tracks4Africa is that because it is user submitted, the information is actually very accurate. While guidebook editors may only contact a camp ground once a year to confirm information, if a camper finds prices have changed or the campground closed, they are able to update the website as soon as they have internet access. Tracks4Africa also sells paper maps, great for back-ups in case you have issues with your GPS and for planning routes. Cell phone coverage in Africa is typically quite comprehensive. But if you have an emergency in a remote area, it is a good idea to have a satellite phone. Satellite phones are definitely an investment. But, consider them insurance. If you do have an emergency where you don’t have cell phone service, you will be happy you have it. You can purchase the phones new, or used through an online auction site like eBay. For a single trip, minutes can be purchased in denominations of 100. These are costly, starting at about $1 per minute. Using the phone frequently? You can also sign up for a monthly contract. There are also companies that offer satellite phone rentals. Starting at a few dollars a day, this can be a great option for a shorter trip. If a phone isn’t enough, you can also use satellites for internet access. These nifty devices aren’t cheap, but they are a great way to stay connected, sharing photos and stories with family and friends at home, all while exploring the African bush. When we got our 4x4 stuck in the mud in the Serengeti, we were very happy we invested in our satellite phone! These days, there are a lot of modern conveniences readily available in many cities in Africa. Unfortunately, ice isn’t one if them. If you are hoping for a cold coke on the road, you will need to look into a camping fridge. There are a lot of different options for coolers while camping. But, only one will be able to withstand temperatures in Africa. If you want to bring a camping fridge on your camping trip, you’ll definitely want to consider one with compressor technology. More expensive and heavier, this is the best option for a long trip, especially if you are planning on traveling through places with extreme heat, like Namibia. These easy to get in South Africa, but are quite expensive. If you have patience, you can find used compression fridges for sale on 4x4 forums or camping websites. The investment is worth it because your food will stay colder longer, and this fridge will last much longer than the cheaper, thermoelectric version commonly sold in the United States. Most now come with digital thermostats and even get cold enough to freeze your food.